2015 UEFA European Under-19 Championship runner-up with Russia. 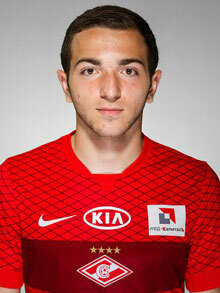 Georgi Melkadze is a Spartak Moscow homegrown player. He made his professional debut for the Spartak reserve team on September 23 2014 in a game against FC Znamya Truda Orekhovo-Zuyevo. He had to wait six months for his debut in the senior side, which came exactly on 17 May 2015 against CSKA Moscow. He has Georgian roots, but has been playing for youth Russian teams, where he recently won second place at the UEFA European Under-19 Championship. It is worth noting that he was the youngest “Sborna” player in that tournament. Hello mate my name is mr Christian Emile,a licensed fifa football agent,currently looking for young talented and ambitious players for Ukraine,Spain,France and England. if interested kindly inbox me because basesoccer is currently recruiting top players for top clubs…. whatsapp +13146691327 hope to read from you on this Regards.